Definition at line 376 of file audioengine.h. Definition at line 1501 of file audioengine.cpp. Definition at line 1510 of file audioengine.cpp. References mCurrentBufferp, mCurrentSourcep, NULL, and LLAudioSource::setChannel(). Referenced by LLAudioEngine::getFreeChannel(), setSource(), and updateBuffer(). Definition at line 383 of file audioengine.h. Referenced by LLAudioEngine::getFreeChannel(), LLAudioChannelFMOD::play(), and LLAudioEngine::startNextTransfer(). Referenced by LLAudioEngine::idle(), and LLAudioSource::isDone(). Definition at line 393 of file audioengine.h. Referenced by LLAudioSource::addAudioData(), and LLAudioSource::play(). Definition at line 1522 of file audioengine.cpp. References cleanup(), FALSE, mCurrentSourcep, mWaiting, NULL, update3DPosition(), and updateBuffer(). Referenced by LLAudioSource::play(), LLAudioSource::setupChannel(), and LLAudioSource::~LLAudioSource(). Definition at line 392 of file audioengine.h. Referenced by LLAudioEngine::idle(), and LLAudioSource::play(). Referenced by setSource(), and LLAudioEngine::updateChannels(). Definition at line 1548 of file audioengine.cpp. References cleanup(), FALSE, LLAudioSource::getCurrentBuffer(), mCurrentBufferp, mCurrentSourcep, LLAudioBuffer::mInUse, LLAudioBuffer::mLastUseTimer, LLFrameTimer::reset(), and TRUE. Referenced by LLAudioSource::addAudioData(), LLAudioEngine::idle(), setSource(), and LLAudioChannelFMOD::updateBuffer(). Definition at line 385 of file audioengine.h. Definition at line 386 of file audioengine.h. Definition at line 400 of file audioengine.h. Referenced by LLAudioChannelFMOD::cleanup(), LLAudioChannelFMOD::playSynced(), LLAudioChannelFMOD::update3DPosition(), updateBuffer(), and ~LLAudioChannel(). Definition at line 399 of file audioengine.h. Referenced by getSource(), setSource(), LLAudioChannelFMOD::update3DPosition(), LLAudioChannelFMOD::updateBuffer(), updateBuffer(), and ~LLAudioChannel(). Definition at line 401 of file audioengine.h. 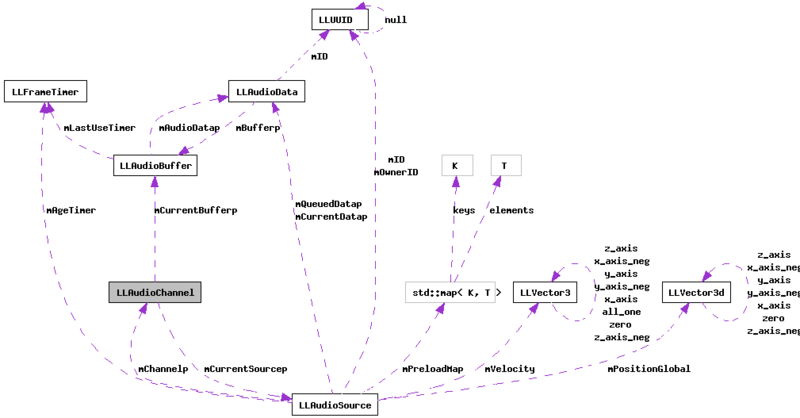 Referenced by LLAudioEngine::idle(), and LLAudioChannelFMOD::updateLoop(). Definition at line 402 of file audioengine.h. Referenced by isWaiting(), setSource(), and setWaiting().